The reception for The Western Connecticut State University M.F.A. Thesis Exhibition, at the Blue Mountain Gallery, is to be held June 21, 2018 from 5 to 8 p.m. 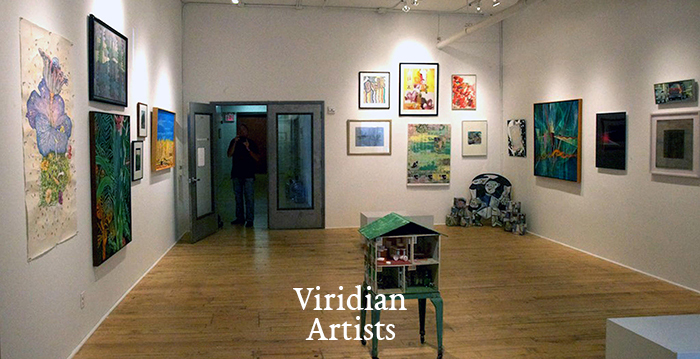 The exhibition will run from June 19th through July 7th. Alyssa Voytek’s graduate work captivates with a journey into chiaroscuro, using shadow and light in her series of black and white pieces. The works, Storage Orchestra No. 1, intrigues me because it is both intimate and mysterious. As if one is close to knowing a secret, yet it hasn’t been unveiled. Voytek paints the ordinary object while giving it luminosity. 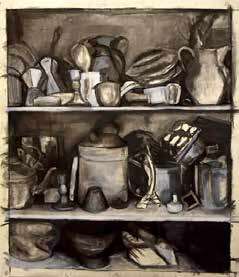 She groups pitchers, candlestick holders, cups cluttered on shelves, and has the instincts of a poet, who writes odes to the everyday object. She celebrates what is right in front of us. This is the artist’s job and intention, whether it is visual or written; to get us to notice what is often unnoticed, the way light bounces off a tea kettle, how shadow shapes the darkness, how the things in our daily life are imbued with beauty and meaning. Jesse Navarra has his drawing hand on popular culture and is tuned into the zeitgeist. 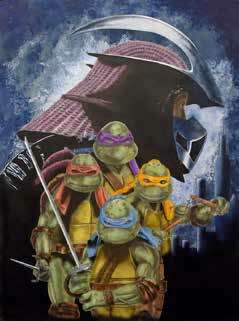 His piece, TMNT (Teenage Mutant Ninja Turtles), is rendered in graphite, acrylic and colored pencils. He portrays the group of turtles facing front of the picture and behind the turtles is the head of a striking and dangerous looking steel helmet of a possible enemy. Ninja turtles were named after Italian artists of the Renaissance, trained in the art of ninjutsu, unconventional warfare. They battle petty criminals, evil overlords, alien invaders while trying to remain hidden from society. Navarra’s piece places us in the center of the action with his composition. At first, one sees the turtles looking deceptively lovable as well as fearsome confronting the viewer. Behind them is the powerful headdress of the warrior/enemy. The artist demonstrates a bold juxtaposition of these two images which appear intentionally unbalanced. Isn’t that what conflict is about? I saw Navarra’s other body of work which is prolific; skillful drawings and beautifully rendered paintings of icons from our cultural landscape. Navarra’s goal as an artist is to be a storyteller and he achieves that in his work. 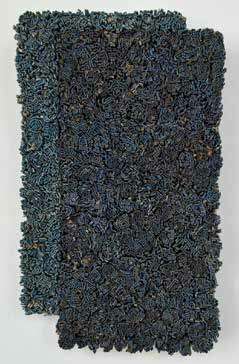 Erin Walrath’s piece, Unto (the blue study), consists of discarded book covers packed together in a dense assemblage. I am impressed by the passion and patience required to create such pieces. To paraphrase from Walrath’s bio, she says, “I dismantle discarded books into pieces to feel like pixels, brush strokes, or individual figures that invoke new meaning from obsolete objects.” In true artistic tradition Walrath takes detritus and recreates it into something meaningful using her alchemy to transform the abandoned object into art. Her work is obsessive, which is elemental in the artist’s life and this obsession comes through as quiet beauty. I saw some of her other pieces which were collages that were minimal, still using old book parts. The collages had the faint echo of Hannelore Baron. Walrath explores both the maximal and minimal illustrating her versatility. Barbara Sinisi’s skill in mastering drawing and painting is evident in her mysterious work entitled, The Void, a mixed media on panel. This work could be in a dense jungle or what we imagine to be the synapses of the mind. It’s a place of bold contrast, darks and lights in a thicket of vines, leaf-shapes, webbed lines. 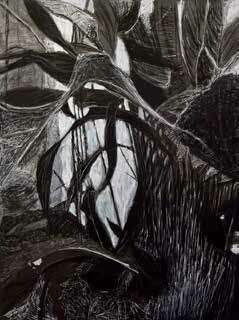 She takes the viewer into a primal, dark place, with biomorphic shapes, although one is not sure where one is. Yet, the beauty of her paint strokes and lushness of her marks are comforting in this jumbled jungle. She invites us to come into the magical place she’s created, seduces us into the darkness, into the childlike drama, into contradiction by sharing her poetic vision and imagination. Jennifer Oliveira-Florio’s work, Gold, is done in encaustic, paper, acrylic and ink. 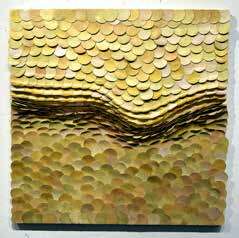 This particular work is densely layered into coin shapes that look like fish scales. In the center of the piece is an undulating movement where the scales tighten creating a ripple effect of sensual energy breaking up the square shape. Florio’s preferred medium is encaustic which consists of using hot wax to strengthen the paper pieces and make it archival. One of the appealing things about encaustic is that it creates a milky veil over the surface thus adding another dimension. This Gold piece as well as her other works thus demonstrates a visual and tactile blend that becomes an elegant esthetic. Jonathan Schreyer is channeling the artist Francis Bacon. Schreyer’s piece, Final Breath, is powerful in the way he uses paint and color while capturing the interior life of the person he’s portraying. 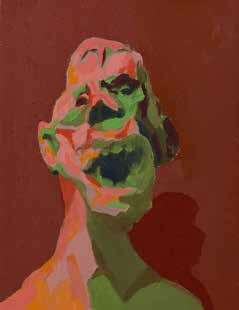 In Final Breath, Schreyer forces us to glimpse at what that might look like with the contour of a man’s face painted green, as the man is exhaling his last breath, perhaps a scream. There’s sadness in this man’s eyes, in the use of unnatural colors such as bright orange and atomic greens. The mouth on the man is cavernous – one could imagine falling into that darkness. Schreyer’s portraits have the ability to look beyond the surface and to see what is in the soul and spirit. His work is brave and shows a knowing and wisdom of what it means to be human.